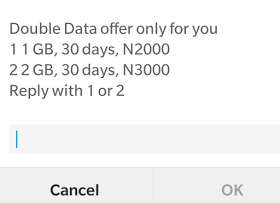 I actually saw a lot of post flooding different blogs and forums about an unbelievable airtel data package which gives you 11gb and 22gb at N2,000 and N3,000 respectively. Of course the news sounds so unreal so I decided to check it out myself before making any post on it. As expected, the news was unsurprisingly fake. This whole mixup was caused by the recent decision of airtel to number both their 1gb and 2gb plans in the option menu without actually putting at least a full stop sign between the actual data value and the nos to make their customers differentiate between both thereby causing a whole lot of confusion. So to all those who are planning to subscribe to this package, I will really advice you not to fall for it and go for other cheaper options like the Mtn, Etisalat or Glo. And to all those who have already subscribed, am really sorry for bringing this up a little bit late.